← Cross-Continental Road Trip! With mushrooms, of course. Chickens don’t want you to have their eggs. Eggs are potential chicks. Mamas don’t generally like to give up their offspring, and they certainly don’t want to know that their potential offspring are going to, instead, be scrambled into your breakfast, or the best part of the salade niçoise you’re going to have for lunch. 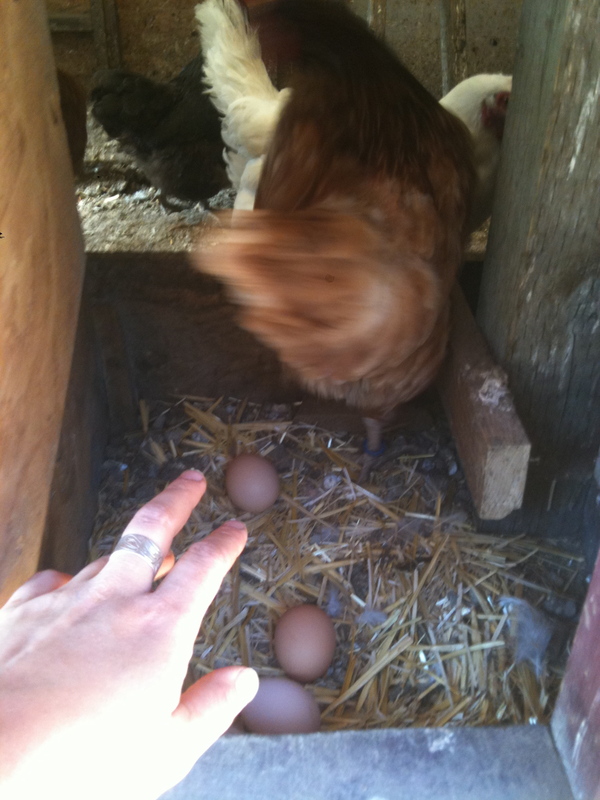 It’s the very fact that the hens don’t want you to take away all that they have worked so hard pecking away at grubs for, that one experiences caution when collecting eggs. Hens peck. Not hard, but they peck, and they have angry eyes, especially when they are broody. There is also the real fear that one can screw up. Eggs have been designed, since dinosaurs roamed the earth, to withstand the mass of a full-sized hen sitting atop the nest. Hens can incubate them into all of their potential glory, but they are still supremely delicate when handled by non-hen hands. A mere brush with the edge of the door frame when turning around too quickly to exit the coop, or a roll off of one’s palm onto the straw lined floor below could be the disappointing end to one of the most important and profitable farm chores. Other fears exist for city slicker fingertips, like goo, and slime, and heaven forbid, poo. All of these things have the probable outcome of oozing under manicured fingernails and into any open wounds one may have obtained while picking thorny blackberries earlier in the day. All of these fears are ridiculous, it’s true, but they are authentic. My farmer friends tell me that once you get pecked a few hundred times, the fears dissipate and collecting eggs becomes less romantic and just another thing you do on the farm. I’ve done it about fourteen times, and I still find it romantic. I still light up with joy while carrying all of our eggs in one overflowing basket. With perseverance and dedication, and the usual quest for experience, I have started a diligent practice in the art of collecting eggs. 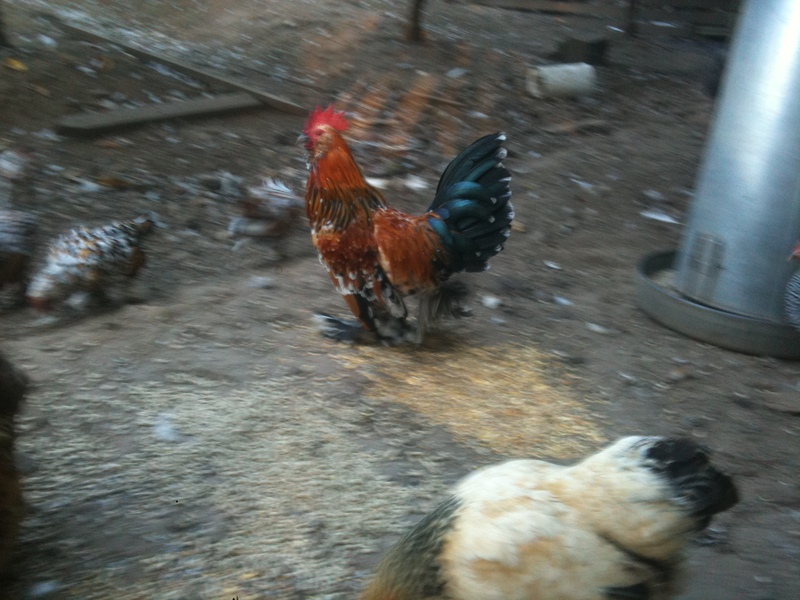 On the farm at which I am currently residing, there live fairytale-feathered poultry. Their eggs are not deposited like automated, bimonthly transactions in a predetermined amount, currency or location. 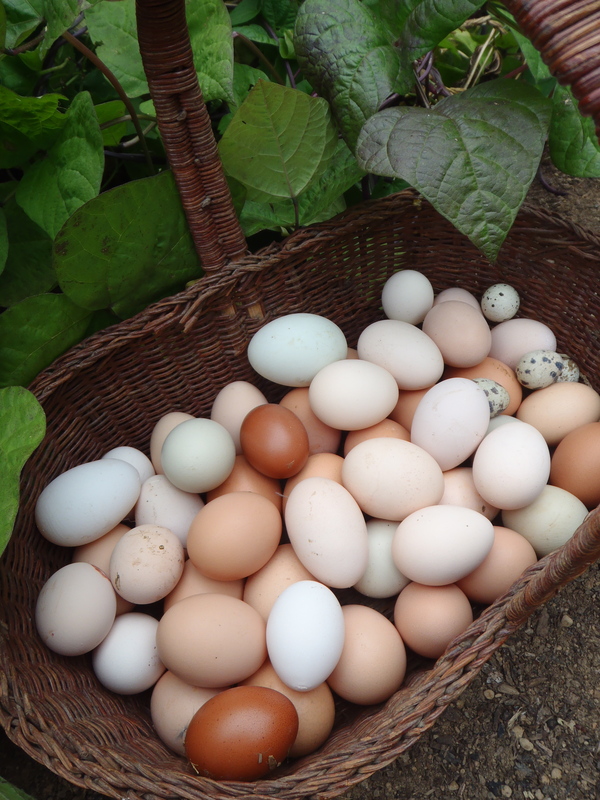 These freelance, free-range eggs come in all textures and colours. They come from chickens with hairdos that Tina Turner would envy, and fancy foot feathers that splay out over talons for which Elton John might shell out thousands. They come from ducks that waddle around two-by-two circumnavigating the greenhouse a la Miss. Clavel. They quack like young moms around the sandbox on a gossipy Tuesday before the end of a mat leave. They come from miniscule quail. Quail with fresh cream, and milk chocolate-coloured feathers that ornament cages. They are beautiful and just as diverse as the heritage breeds accounted for in the latest 4-H county fair competition. The moment that makes it all worth the initial agony, apart from whisking dark orange yolks into sweet crème brulee, is when those untrained fingers wrap around a warm, round nugget nestled in a layer of straw. All is well in the world if you’re lucky and hens peck away at rubber boots, nowhere near within pecking distance of delicate skin. A warm egg fits perfectly into an adult sized palm. A blue hue, or cloud white, tan like the fur on the neck of a grazing deer, or toffee brown reminiscent of chewy molasses candies in Halloween harvest pillowcases. Each egg comes with a personality; pointy, type-A, and uniform in tone, or round, voluptuous and spotted. The quail eggs are especially charismatic with patterns that would give Pucci a run for his money. Each tiny offering, each miniature miracle is a whimsical mess of polka-dots and speckled splendour. The first of, now, many harvests was the most exhilarating. 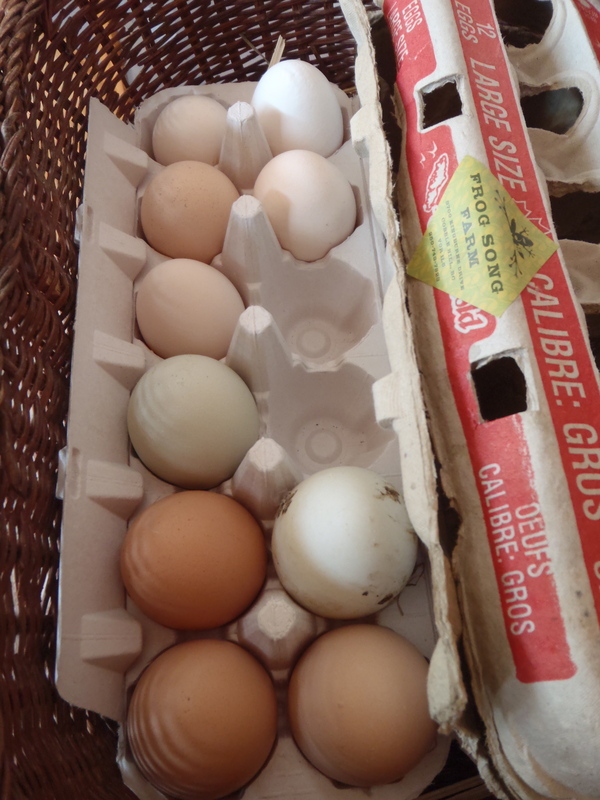 I walked proudly into the farmhouse with 32 chicken eggs, 4 duck eggs, and 9 quail eggs. 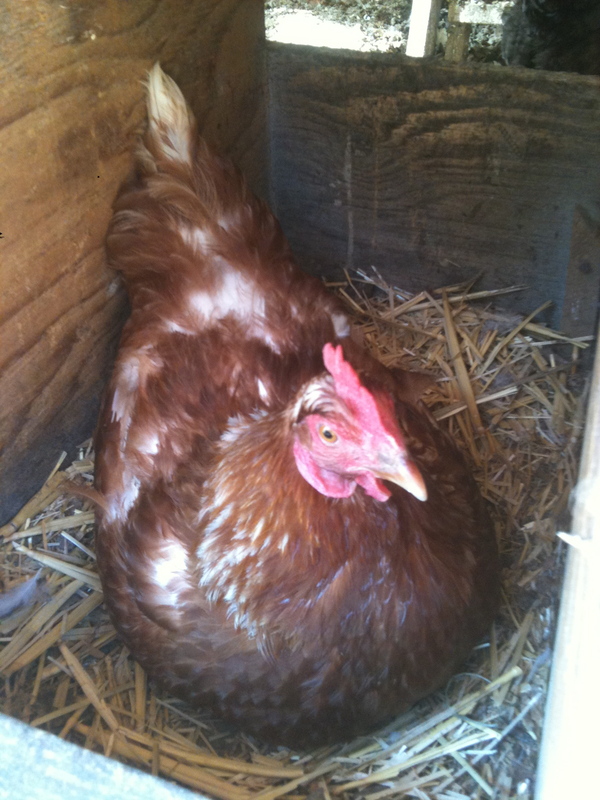 Other days the hens will have taken a well-deserved siesta from the grind and I will carry home a meager half-dozen. Each day is different and each day comes with that much more confidence when sticking an arm into the hutch. The jaw loosens, and lips turn up at the edges. It only takes a few pecks on the wrist from a cheeky bird before the realization comes that it’s really no big deal; shoulders drop. Egg collecting now becomes the highlight of every afternoon. I place each one in my basket, tuck my strong arm underneath, and make careful strides toward the house where they will be given individual, tender love and care, be cleaned and then tucked away, points down, into a cardboard cot ready for market. 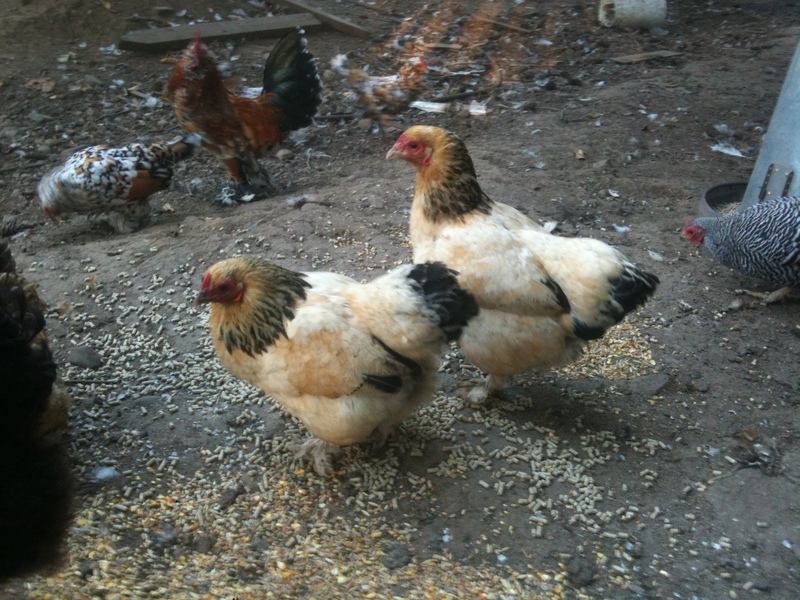 This entry was posted in Agriculture, Events and Life Stories, New Places and Exploring and tagged chicken, Eggs, farm, fear, harvest, hen, rooster, yolk. Bookmark the permalink. I recently learned how to make a lemon tart that uses a lemon sabayon for the filling… some of those delicious looking eggs would be perfect… mind sending a few to Albany NY?